ACVic presents the two educational projects selected from the open call Art Jove 2015 from the Sala d'Art Jove de la Generalitat de Catalunya as part of the collaboration between the two organisations. Maniobres d'evasió (Evasive Manoeuvres), a project by Isabel Barios Ibars and Miriam C. Cabeza on the subject of artistic intervention as a tool for mediation in healthcare-related contexts, and Mirades post-generacionals (Post-generational Perspectives) by Carlos Canales, Àngel Garau and Judit Onsès, a project which studies the sharing of personal experiences among people of different generations. Cristian Añó and Marta Ricart gave tutorial assistance to the artists. Evasive manoeuvres is a project created to analyse how a community might take control of its own healthcare, creating therapeutic processes different to the official and conventionally established. The project was put into practice in the CAP (Primary Healthcare Centre) Sud in Sabadell between May and December 2015, and coordinated jointly between professionals and neighbourhood associations within the district. Together, these organisations assessed the healthcare and social problems within their district, with the aim of dealing with them collectively by working with those affected by these problems. 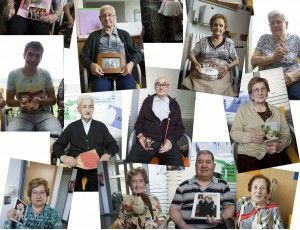 Having ascertained that urgent intervention was necessary among elderly people at risk of isolation, an open group called "Community Art" was created, integrating different users from within the CAP's catchment area, for whom a series of weekly workshops were set up which have turned into a meeting place where old folk share memories, interests and hobbies. On the one hand, this project serves to highlight that the exchange of experiences can help us to put together a programme of collaborative art based upon participants' own needs and desires, while on the other, serves to create a connection between the fields of art pedagogy and community health. Isabel Barios Ibars Graduate in Fine Arts (Universitat de Barcelona 20092014). Currently studying for a nursing degree (EUI Sant Pau, Universitat Autònoma de Barcelona). Training in video and sound editing at LabMedia (Facultat de Belles Arts, UB). Recent works: Triple Mortal (La Capella, Barcelona 2014) and Tornant a l’essencial (DAFO Projectes, Lleida 2014). Miriam C. Cabeza Bachelor's degree in Fine arts (Universitat de La Laguna 20072013). Guest participant at Jornades Articula’t 2013, Processos Creatius i Educació with the project Identidades Souvenir. Member of the group Zona Onze (since 2014), resident at Can Batlló (Sants-La Bordeta), initiating dynamics which combine, in network, arts practice and social issues, from a local perspective. Isabel Barios and Miriam C. Cabeza met at Facultat de Belles Arts de Barcelona, where they shared a workshop and similar approaches to art. Together they are members of the collective Infarto (from 2013) organising ephemeral and self-managed exhibitions in private houses: Infarto en Shangai, París era un festín, Pepito Valencia ya no quiere a su madre and Basilisco in Da nieve . elderly within neoliberal capitalist culture. It also established a framework within which to make a cross-connection of perspectives, a questioning of ideologies and a construction of subjectivities, favouring personal and collective creation, and opening up a space for reflection. developed based upon the premise of working on themes of desires and the future, resulting in the preparation of a space mission to go to the moon. The collective formed by Judit Onsés, Carlos Canales, and Àngel Garau is not a properly established partnership. We have joined together for this project to share interests and methodologies regarding collective education, collaborative and collective artistic practices and social research, understanding art as a tool for generating learning spaces, promoting transformations in the field of intervention, and conducting research related to the social and educational fields. Thus, we become mediators where our focus is not centred on producing a work of art, but on making processes and empowering spaces for collective education.